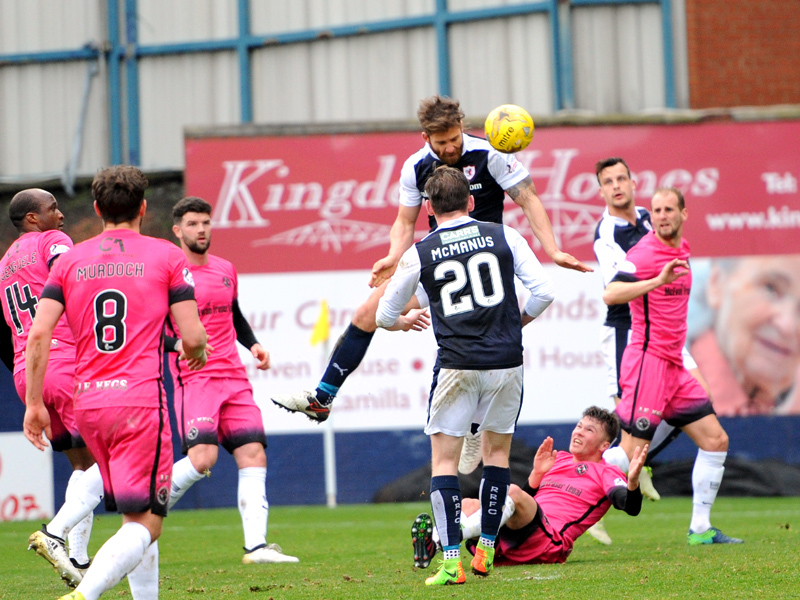 Raith Rovers bounced back from their disaster in Dumbarton last weekend, with an excellent, yet nervy 2-1 win over Dundee United this afternoon. 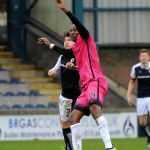 Goals either side of half-time from Craig Barr and Ryan Hardie handed Rovers a merited two goal lead, although a response from Simon Murray with ten minutes remaining, meant nails were bitten to the quick by the time Craig Charleston blew for full-time. Despite the nature of last week’s 4-0 reverse at the Cheaper Insurance Direct Stadium, manager John Hughes made just one change for the game, with Bobby Barr kicking his heels in the dugout, with his place taken by Jordan Thompson. It would be quite the understatement to suggest that neither of these sides were in the richest veins of form heading into this one, but it was the visitors, in their neon-pink jerseys who made by far the smarter start. 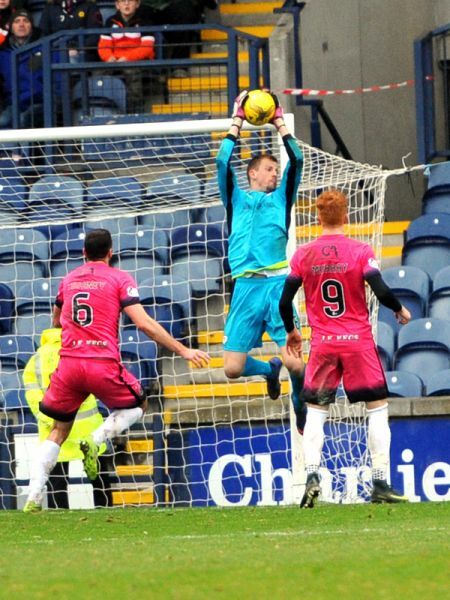 It was a former Raith man who tested Pavol Penksa first of all, when Lewis Toshney got on the end of a free-kick which was swung into the area, but whilst it was on-target, the Raith ‘keeper plucked it safely from the air to give him a confident start to his afternoon. He was less involved in United’s next chance, when Tony Andreu let fly from a free-kick 20-yards from goal, but the Frenchman didn’t quite catch it right, and while he still managed to muster some pace into it, his effort went wide of the right-hand post. The midfielder then came close again a minute later though. Thomas Mikkelsen did well to get to the bye-line, and his low cutback found Andreu in a yard of space, but his attempt was diverted wide in the nick-of-time by a sliding challenge from Ross Matthews. Rovers may have been second best for the majority of the opening period, but they should have taken the lead with two gilt-edged chances after quarter of an hour. The first fell to Ryan Hardie, after he was the fortunate beneficiary of a wild clearance which rebounded kindly to him. 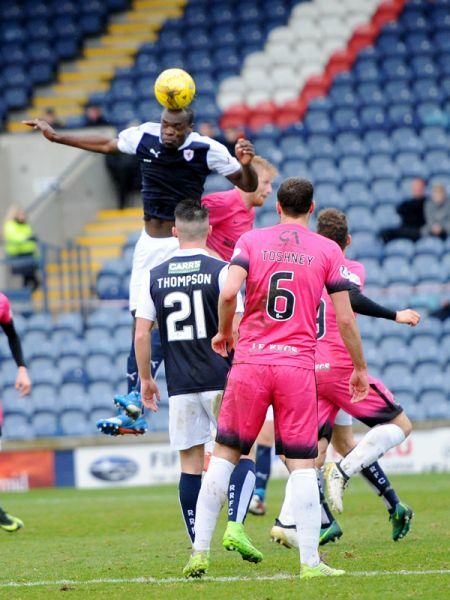 However, after bearing down on goal, custodian Cammy Bell narrowed the angle well and blocked his shot. The second chance was just a moment later, and if anything, was even easier. Declan McManus was the architect, picking up possession and running at the heart of the United back four, before threading a through pass to Thompson. However, the Nortnern Irishman couldn’t quite adjust his feet in time, and with United defenders closing him down, he could only toe-poke the ball wide of Bell’s left-stick. It was a clear sign that United were there to be got at, and the flurry of action seemed to lift the players as well as the fans, however, they almost shot themselves in the foot five minutes later. Jason Thomson’s thrown in went straight to a pink shirt, and after the ball was directed long to Simon Murray, he went down in the area under duress from Barr. 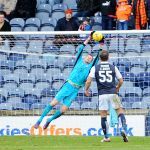 At first glance, it looked neither a penalty nor a dive, but it didn’t do Murray’s popularity any good amongst the Raith fans, who gave the flame-haired forward a power of abuse over the course of the next few moments. While Rovers had to be wary of the threat provided by the industrious Murray and the talented Andreu, Rovers were enjoying the better of the half as it dragged on, albeit without testing Bell. However, that changed in the 40th minute, as the home side took the lead. 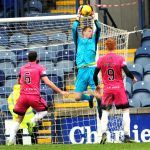 Thomson was impeded on the right touchline during a foray forward, and from Chris Johnston’s free-kick, Barr timed his leap to perfection to nod a the ball past Bell and into the left-hand side of the net. With both teams low on confidence, the first goal was going to be even more important than normal, and thankfully from a Rovers point of view, it was they who took the slender lead into the interval. If John Hughes team-talk centred on the importance of the players not resting on their laurels, then they followed his instruction to the letter, by doubling their lead in the 48th minute, thanks to some woeful defending from the visitors. 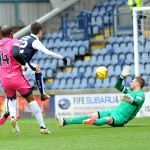 Mark Durnan miscued his kick on the half-way line, then decided he’d try and recover his error by controlling it with the palm of his hand. From a long set-piece, Jean Yves M’Voto nodded it back into the area, and whilst it appeared meat and drink for Willo Flood, he allowed it to run under his foot for Hardie, who took a touch, before firing past Bell and into the bottom left corner. Rovers scented blood at this point, and McManus drilled a good ball across the face of goal, but it was just too far ahead of Hardie who couldn’t connect. 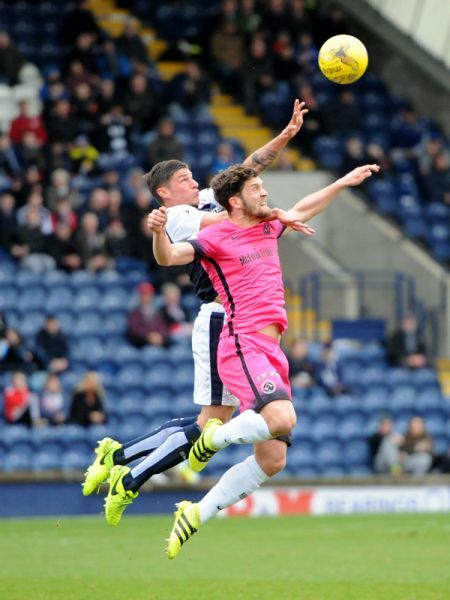 Rovers continued to press, and Durnan made amends for his earlier indiscretion, but only just, as he nodded a cross past his own post under pressure from Hardie. After that though, United started to enjoy far more possession, with substitutes Alex Nicholls and Ali Coote at last stretching the home defence with width, something which they’d failed to provide for the first hour or so. Despite that though, the vast majority of their crosses and punts forward, all seemed to land on the head of M’Voto, who was something of an immovable object in the centre of defence. Coote was proving something of a handful, and after drifting inside, he probably should have reduced the arrears, but his shot was too close to Penksa who saved well. With ten minutes remaining however, United set up a grandstand finish. 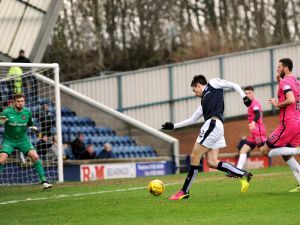 A free-kick into the area was headed clear, but after being directed back into the penalty box, Murray was the most alert player in there, gathering it up amongst a clutch of players, before placing it into the right-hand corner. United were now launching everything they could into the area, but Rovers almost made sure of the win with two chances in the closing stages. First, Barr almost grabbed a carbon copy of the opener, but this time, his header from a Johnston corner crashed off the inside of the post. Then Johnston somehow missed a huge opportunity, when he was teed up by McManus, but with half the goal sitting vacant, he stabbed his shot over the bar. 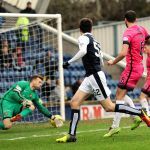 There was drama down the other end before full-time, with Penksa saving at the feet of Durnan, after the central-defender had bulldozed his way through. 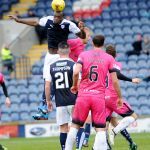 Four yellow cards were then brandished for the same incident, after a massive stramash in the Rovers six-yard-box, as tempers flared in the closing seconds. 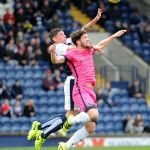 The win lifted Rovers up to seventh in the table, and despite the poor run, they find themselves just three points behind fifth placed Queen of the South, who visit Stark’s Park next weekend. With all three bottom clubs winning, it’s still incredibly tight at the bottom, although with Dunfermline losing to Ayr, half the division is now involved in a scrap to stay up. Dundee United take the field in their away strip (lurid pink)... I'm not sure how orange clashes with blue! 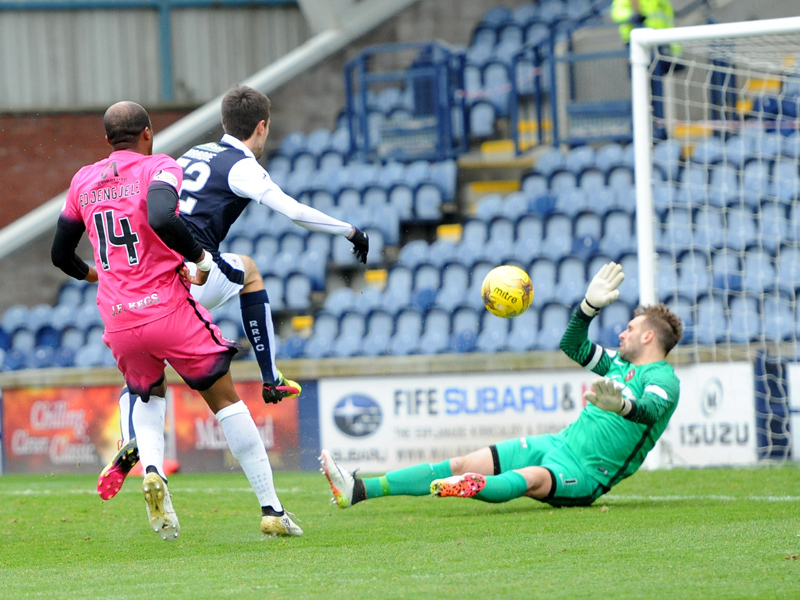 Big shout for a Raith penalty - Thompson broke into the box and seemed to be shoved to the ground. Nothing given. 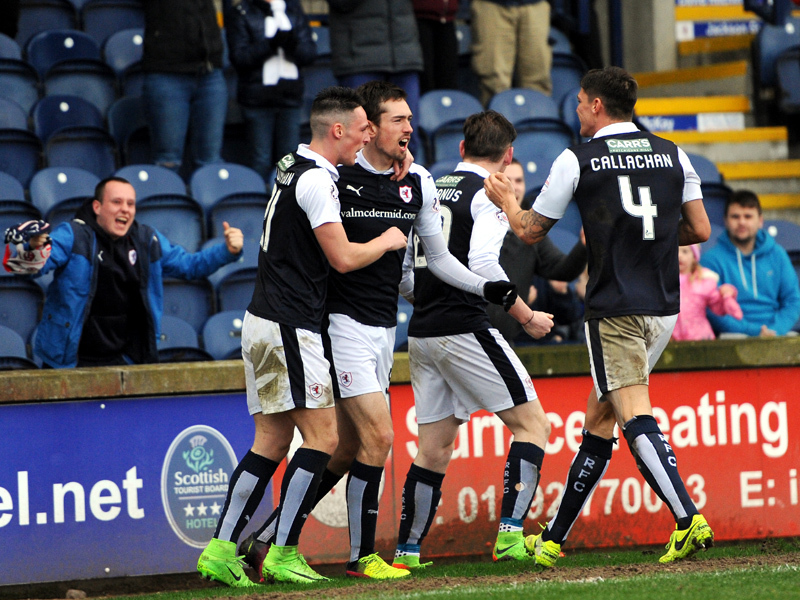 1-0 RAITH! Big Mango Barr rises unmarked to slam the free-kick in with his head! Great goal to go in to the break in front. Solid at the back, plenty of energy, not too many chances though. 2-0 Hardie after Durnan misjudged a high ball. Great finish!!! Good break from deep by Johnston. He passes to McManus who puts a teasing ball just out of reach of Hardie's slide. ... looks like he's okay. Phew!!! M'Voto named man of the match. That award will be the pride of Big Jean Votie!!! 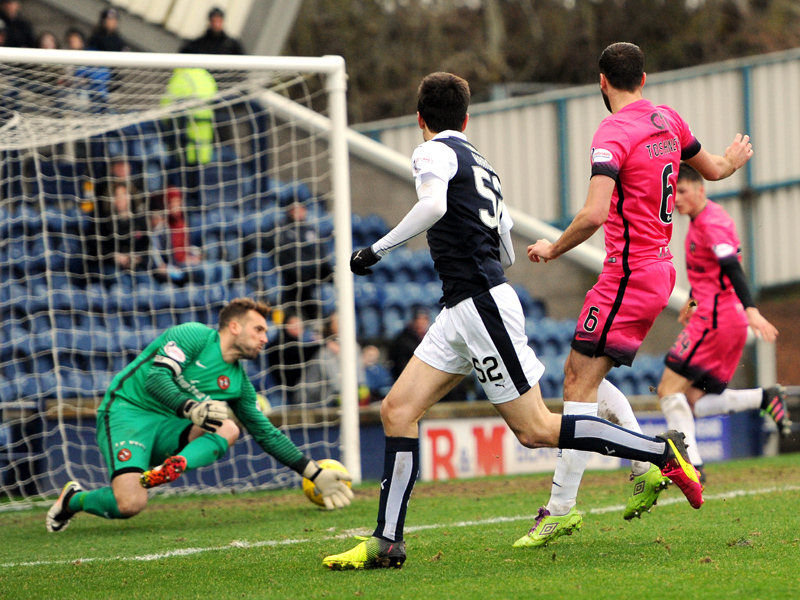 Major stramash in the Rovers goalmouth. The ball was knocked out of Penksa's hands, the whistle went for the foul, then Edjenguele reacted angrily. Four yellow cards shown, no idea who to! 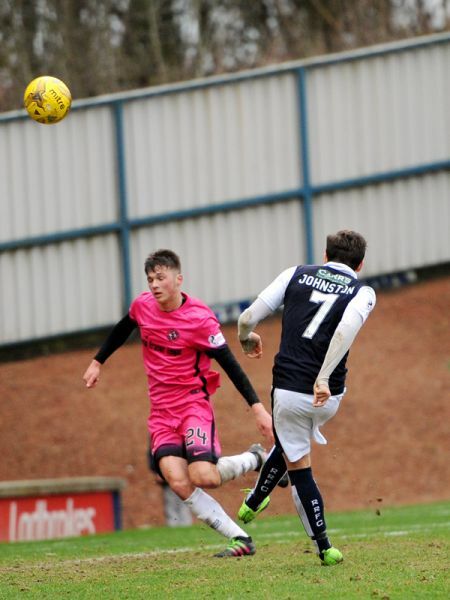 +2 Johnston skies an absolute sitter! Defence all over the place and McManus picked him out well at the back post. 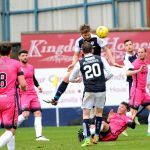 After the huge disappointment of last weekend’s 4-0 loss to Dumbarton, Rovers head into this Saturday’s match with Dundee United, desperate for a result to keep their noses in front of Ayr United. 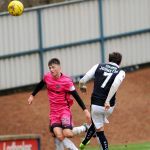 The gap remains at four points after the Honest Men also suffered a heavy defeat last weekend, but with the two scheduled to meet on the final day of the season, Raith will be looking to avoid the potential prospect of a last-gasp, winner-takes-all affair. 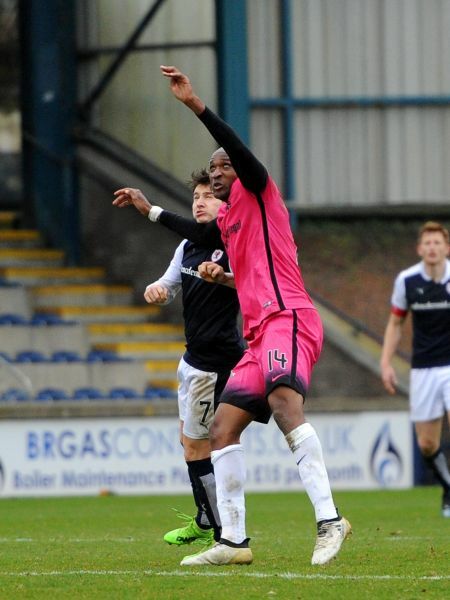 Both teams go into this one in poor form, with United losing their last two, after defeats to Hibernian last weekend and St. Mirren in midweek, a result which leaves Ray McKinnon’s men fourth in the table, a point behind Morton, and four behind second placed Falkirk. 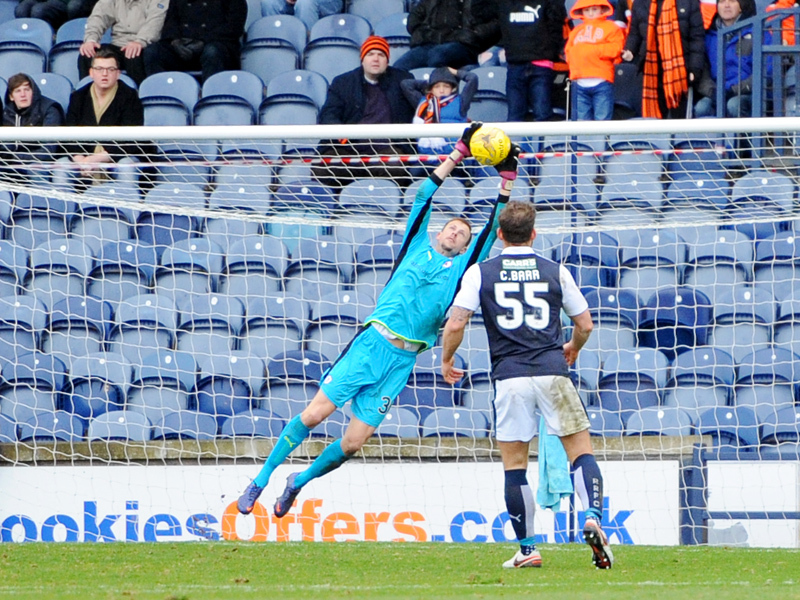 Rovers have yet to beat Dundee United this season, although they have taken a point from them on two occasions. 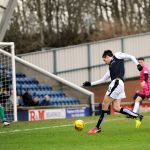 The first was in August, when goals from Jordan Thompson and Kevin McHattie saw Raith fightback from two goals down to salvage a point, while there were no goals in the second meeting at Stark’s Park in December. It was a different story in February though, when United ran out convincing 3-0 winners. 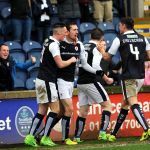 While United have only lost once at Tannadice this term, Rovers will be hoping to take advantage of their indifferent away form, which has seen them win-less on their travels since December last year. Rovers have a reasonable record in the most recent league meetings, with three wins and three draws from the last ten match ups.